The beauty of a hotel is hardly ever complete without perfectly manicured greens. Gardens are sights meant to relax the mind of the guest. 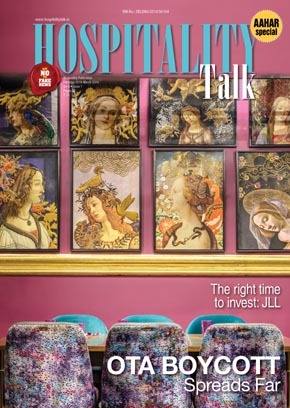 Hospitality Talk, in conversation with hotel spokespersons, gets you a clearer picture of how landscapes make for a hotel’s unique selling point. In a flourishing city like Hyderabad, quite often you are surrounded by a modern landscape with tall buildings, offices, and busy roads. Located in the nerve centre of the city, our 15-acre complex is surrounded by gracefully manicured gardens and lawns that offer a resort-like feel amidst the bustle of the city. For travellers and organisers looking for a refreshing view, a healthy and stress-free environment, and open venues for casual evenings, the hotel scores well. 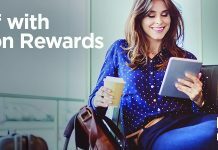 Organisations that prefer environment-sensitive hotels and believe that healthy spaces incite productivity have been making our loyal guest list. With an uninterrupted view of the greens and flexible event spaces, we can comfortably curate dynamic and memorable experiences for our guests. 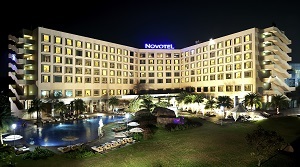 Novotel Imagica Khopoli is in a greenfield area just off the Mumbai-Pune expressway and is spread over 7.8 acres. The hotel is a perfect combination of tranquillity and thrill, with neatly done landscapes and garden areas. We believe, guests today appreciate ergonomically designed hotel interiors with beautiful exteriors and open spaces to suit dynamic needs for MiCE activities. Modern hotel landscapes and gardens provide guests with the opportunity to relax, party, conduct team-building activities and open-space conferences. The possibilities are endless! 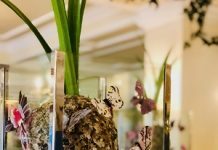 Hotel landscapes have proven to be an important selling factor in major business or leisure hotels as they provide a sense of calmness to the weary traveller. A landscape promotes a relaxed, clean, and green environment that allows the traveller to detox and forget the clutter of routine life. It has also been scientifically proven that areas with landscapes allow guests to relax quicker due to a higher level of oxygen. Today, cosmopolitan cities can also be termed concrete jungles because all you see is brick, mortar, steel, and glass panes. For individuals wanting to break away from their busy schedule or those looking to relax, greenery is what they seek. So, a hotel that offers greenery through lawns is welcomed by a guest. Thus, the plants, mowed lawns, paved pathways, and garden structures can be a unique product for city resorts. Landscapes and features are important because they contribute significantly to our well-being and quality of life, and hold the primary unique selling factor by creating a positive perception and enhancing property value. Visitors and guests form their first (and often lasting) impression of the quality of a hotel establishment from the exterior of the building and the grounds in which it is set. An attractive, clean, and well-maintained appearance is a reassuring indicator of commitment to high standards within. Creatively designed, ‘inspirational’ gardens can influence a guest’s decision to return or his/her will to recommend the hotel to others. The appearance of the grounds for a commercial business can add or take away from the community. An overgrown lawn with weeds, branches, leaves littering the grass, unsightly cracks in the pavement, and discoloured turf can make any property unattractive. These days, hotels have to be pleasing to the eye for guests. While service is the heart of a hotel, the blood that flows in a hotel is its landscape and greenery. Lush green environs, in this concrete jungle, is what guests are looking for these days. In today’s world of concrete jungles, there is nothing better than to see, feel, and smell the green. Landscaping enhances the ambience of any open or enclosed space, and even more so in the hospitality sector. Resorts thrive on offering the ultimate luxurious experience amidst whispering palms, beautiful lawns, and verdant greens. 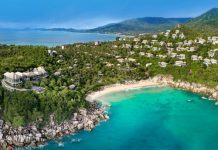 In the present time, no hotel or resort is complete without beautiful landscaping and gardens to support the property; they only add to the beauty a property could possess. The USP of Lazylagoon Sarovar Portico Suites is that we host guests in the lap of nature. Ours is a perfect blend of effective, mindful landscaping. Here you will find tall swaying palms and cosy rooms set alongside a lazy lagoon. We create a peaceful escape from the humdrum of the city.